website, e-mail id, phone no. Hardwar Hotels Guide provides you the facility to select the rooms from over 50 luxury hotels, budget hotels, deluxe hotels, cheap hotels, lodges & guest houses and resorts in Haridwar. You will be glad to note that our site visitors have selected the hotels they patronised (Listed below). They have whole-heartedly sent us their recommendations and more are still pouring in. 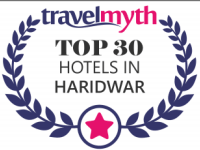 We can't put their names but to honour their letters, we have decided to highlight the "Best 10 Haridwar Hotels" who topped & excelled in travellers' ranking in all departments viz: Location & promixity to places of tourist interest, maintenance & upkeep of hotel, rooms, amenities, food, assistance... all that a paying customer expects. This list will keep on changing, obviously based on feedback. We want to emphasize that to us our Visitor's feedback is most important. We are, in fact driven by them. Note: As "HaridwarHotelGuide.Com" is revamped with addition of more hotels, so little difference in Hotel Tariff, Distances, Locations, Hotel Contact Details is obvious. Plush with serenity, purity and elegance, Haridwar is one of the most sought after destinations in India. Situated in the Haridwar district of Uttarakhand, the ancient city of Haridwar is visited by people from all over the world, both Indians and foreigners. With multiple reasons to visit this place, the city of Haridwar is a perfect destination to visit for different genres of people. Where religious people relish the joy and pleasure of taking a holy dip in the Ganges, on the other hand people from all age groups visit Haridwar for business or leisure purposes. Haridwar offers plenty of choices to the tourists besides visiting temples. With so many places to visit in Haridwar, the city has become a hotspot for tourists visiting for different purposes. The city is just 20 km from Rishikesh and 220 Kms from Delhi. As Delhi is just 220 km away, the city has even become a weekend getaway. The travellers look for low budget and economy stay with discounts. Haridwar is bustling with people, restaurants and yes, numerous places to stay. There are more than 400 accommodation choices here that include resorts, lodges, guest house, luxury hotels, budget hotels and even Dharamshala. This makes it quite tough to choose. With haridwarhotelguide.com, it has become quite easy to choose. A comprehensive site, it has detailed information covering Over 50 hotels. The site is especially designed for Haridwar Tourism. Tourists can find hotel packages and look for deals and offer here. Get Best Deal and make direct hotel booking by getting in touch with us. For simplifying your search, you can Browse Hotels by location on our website. You can readily and easily find Hotels near Har ki Pauri, Hotels on Ganga Ghat (Bank), Hotels near Shanti Kunj, Haridwar Hotels on NH 58, Hotels between Haridwar and Rishikesh, Hotels near Market, Hotels near Railway Station, Bus Stand, Hotels near BHEL, Hotels near SIDCUL, Hotels in Kankhal, Hotels near Patanjali Yogpeeth, Hotels near Haridwar Industrial Area, Hotels Near Shivalik Nagar, Hotels Near Rajaji National Park, Hotels Near Ranipur More, Hotels Near Mansa Devi, Hotels Near Shiv Murti, Hotels Near Ram Ghat, Hotels Near Bhupatwala, Hotels Near Ganga River, Hotels Near Jwalapur, Hotels Near Prem Nagar Ashram and Hotels On Delhi Highway. With a wholesome list of selective hotels, we hereby simplify your task of booking tickets. You can now easily find and book your hotels as per your requirements. We understand every need and requisite of our customers and hence leave no stone unturned in making their experience a memorable one. Haridwar Hotel Guide gives you a brilliant search experience of browsing Hotels by category. Catering well to every such requisite, one can choose Luxury Hotels in Haridwar, Heritage Hotels in Haridwar, Deluxe Hotels in Haridwar, Budget Hotels in Haridwar, 4 Star Hotels in Haridwar, 3 Star Hotels in Haridwar, 2 Star Hotels in Haridwar, Lodge and Guest Houses in Haridwar. We truly understand the budget constraints of our visitors and thus we have provided an exclusive option to browse Hotels by Tariff. We have listed hotels ranging from INR 400 to INR 3000 that will well cater to your demands and needs. Moreover, visitors can specifically seek hotels whose Tariff starts from INR 400, Tariff starts from INR 800, Tariff starts from INR 1500 and Tariff starts from INR 3000/-. Visitors can contact the Hotel Directly through the site and get Guaranteed Lowest Tariff on individual and Group Reservation. Moreover, making your plan for best haridwar darshan successful, you can Call or Fill in your enquiries directly to Hotel with No travel agent commission and No Extra Charge. Copyright © HARIDWAR HOTEL GUIDE. All Rights Reserved.